How to break into the professional game audio industry! Are you a recent college graduate from an audio engineering program trying to get your big break into the industry? Perhaps you are currently enrolled in an audio or gaming trade school like Full Sail and wondering how you could possibly compete with all the other classmates to get a job in the audio of video game audio industry? Maybe you simply love making music and creating new sounds on your home set up and wonder how you could turn that into a full time career? I’ve got some GREAT NEWS for you! 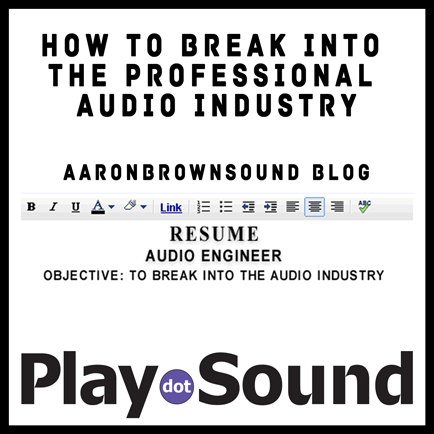 Aaron Brown made a very detailed blog post with an outline all about how you can become successful in the professional audio industry. It is a very concise article about how to jump start your career into the game audio industry. It is full of great tips based not only on Aaron’s own experience of breaking into the industry, but lots of tips he received along the way from other industry insiders! Aaron Brown started his career back in 2002 when he enrolled in the CU Denver Audio Production program. Like many people just starting out, he had no connections in the audio or games industry. The process he outlines in this article is how he changed from a home studio audio amateur to eventually working at world class recording studios and with game companies like LucasArts, Sony, EA, Disney, and more! If you know anyone who is interested in professional audio please forward this on to them.